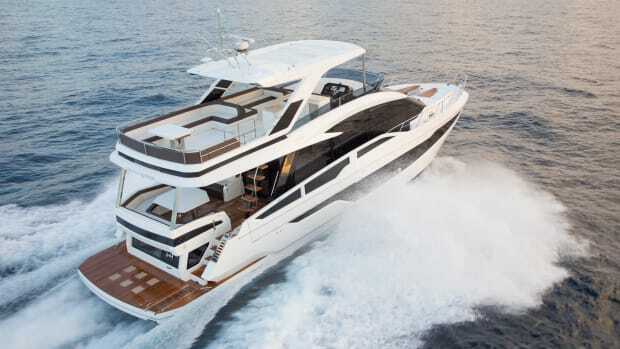 The Everglades 435cc hits 58 knots, stows 40 fishing rods and shreds a challenging sea. Awakening in Marsh Harbour to a pounding surf in Abaco Sound and 25 knots of prevailing breeze out of the northeast may have stopped my playdate with some boats, but not the Everglades 435cc. 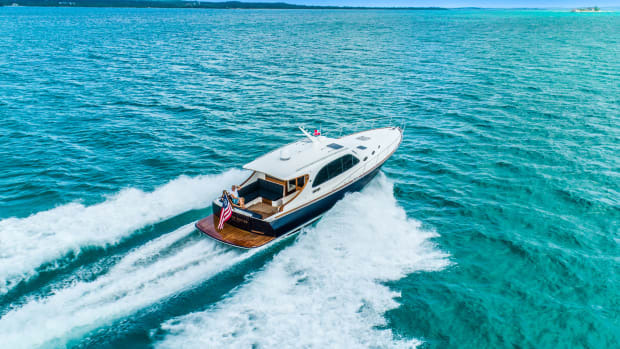 Under the circumstances, a weather delay would have been well received under the realm of acceptable protocol, but for this flagship of a brand that touts its boats as “unsinkable,” this Bahamas blow was just another day at the office. We had the water pretty much to ourselves, save for some hard-core sportfish boats—and the 435cc seemed totally in her element. 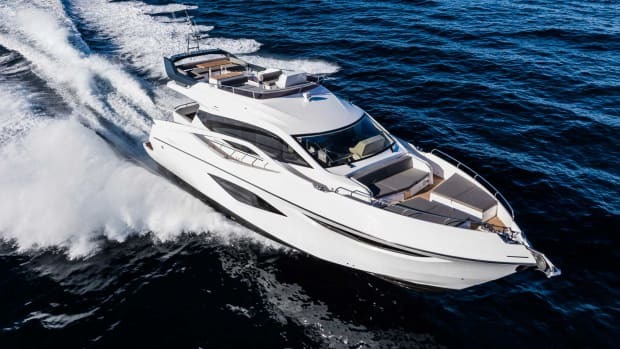 The robust 43-footer raced up on plane with ease, thanks to a quadruple rack of the standard Yamaha F300s that can push her to the tune of somewhere just north of 50 knots. (Expect the optional Yamaha F350s to hit closer to 58 knots.) 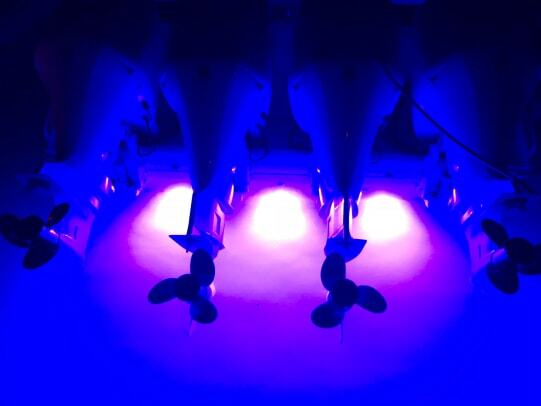 When I inched the pins back to a more fuel-efficient 40 knots, she burned 50 gallons per hour, as advertised. 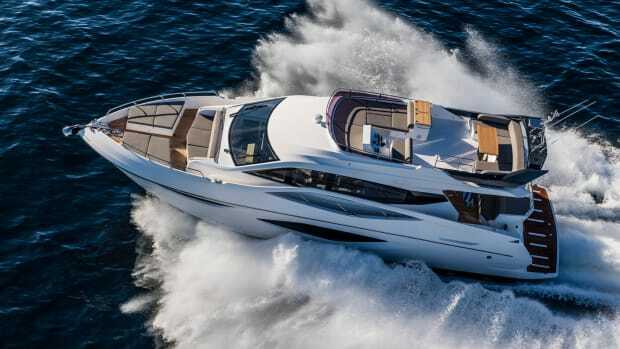 With Yamaha F300s, the 435cc carves up the waves at just north of 50 knots. She tops out around 58 knots with the optional F350s. What I didn’t expect was the level of comfort at that clip in such slop. The Seakeeper gyrostabilizer hiding in the bilge made its presence known, and despite the sea landing some pretty aggressive hooks and jabs with the occasional uppercut, the 435cc never once landed hard, an attribution of her radical hull design, which features a variable-deadrise deep-V with a staggering 25 degrees at the transom. On a kinder day, we might have even enjoyed opening the hydraulic, tempered-glass retractable windshield for a hair tousle, but who’s complaining about being dry? 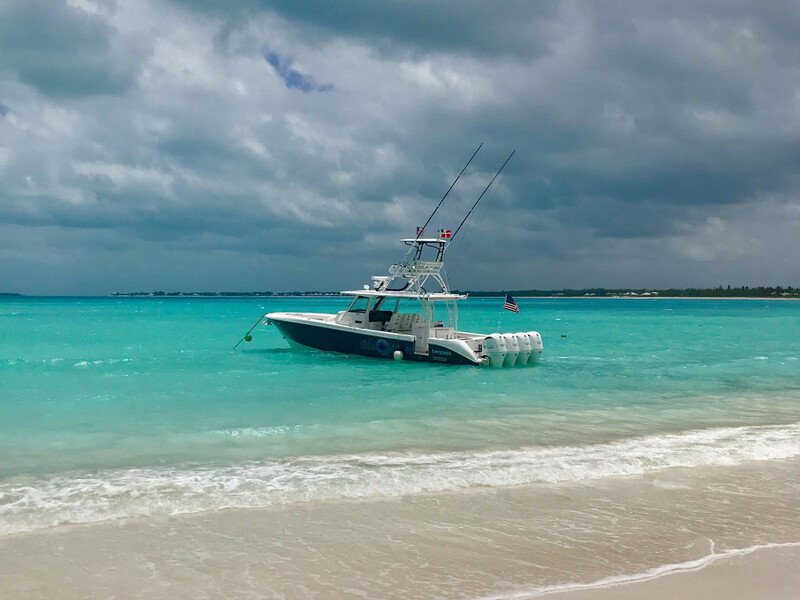 We could have easily joined the big boys and slayed a few wahoo, but our itinerary took us on a longish hike up the sound to Treasure Cay, where we grabbed a mooring about 10 feet off the beach and waded ashore for lunch. Having that kind of access in short water is a testament to the 435cc’s versatility as a tough-built machine and a reliable day cruiser. 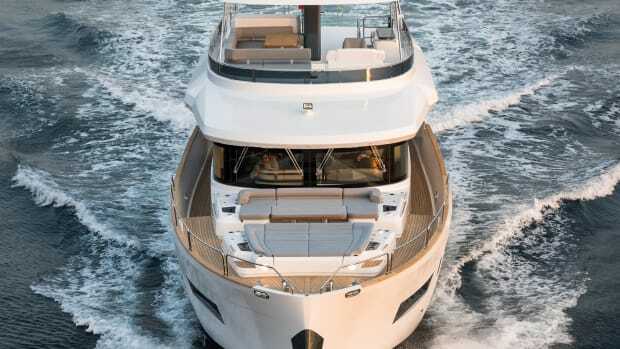 She’s a head-turner from shore—as most center consoles with bulging quads tend to be—but it was her gumption that turned heads on this day, leaving one couple at the restaurant to remark at how shocked they were to see any boat out on the water in such conditions. 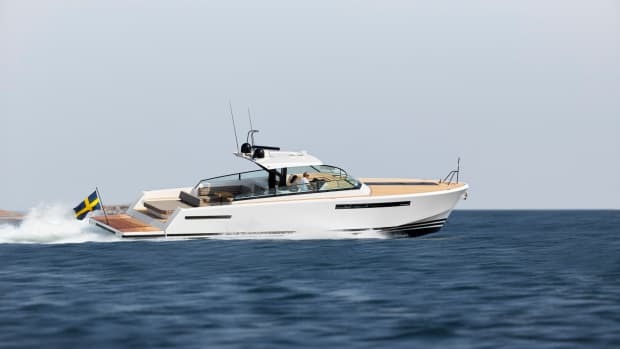 Her hull and performance make the 435cc as fine a near-offshore platform as most small convertibles, and her streamlined center console design is well fitted out for her class. 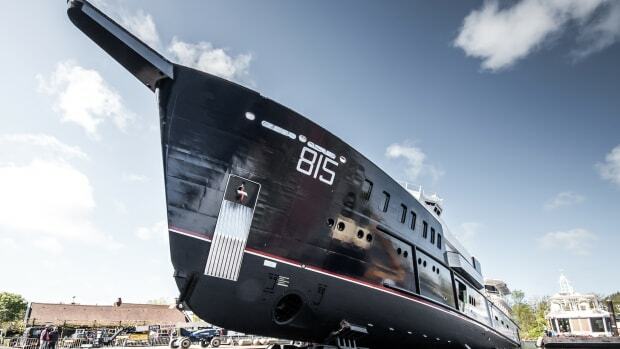 She has a serviceable berth; a galley with sink, refrigerator and microwave; a flat-screen television; 10,000 Btu of air conditioning; and a head/shower area with a privacy curtain. You won’t sleep the whole family down there, but it more than meets the need it’s designed for, which is to have a nice place to get out of the weather, eat, snooze and shower. Still, with napping accoutrements limited to two, you’re probably not making many overnight runs to the canyons—although you could if you wanted. 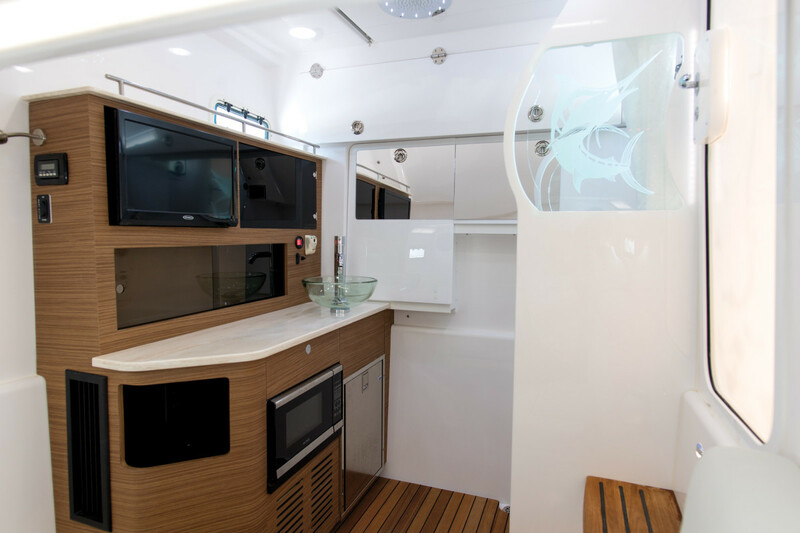 Up on deck are fishing and cruising amenities in a walkaround layout whose space is surprising given the console’s girth. 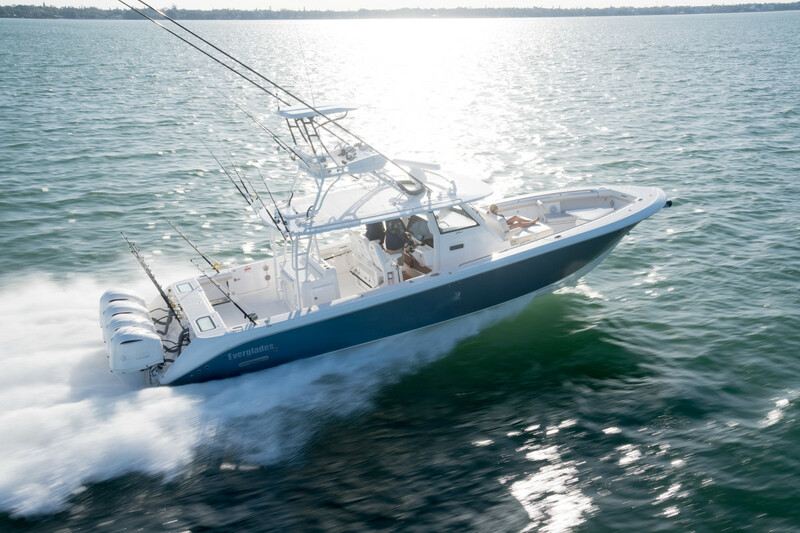 A side-boarding (aka “tuna”) door leaves room for two rows of covered, cushioned seating under the console ceiling, and there are padded lounges with angled backs and armrests for two forward, above a 225-gallon fish locker. 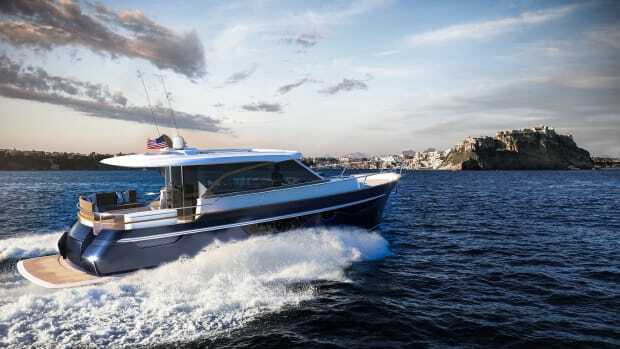 Two more lounges are farther forward over the port and starboard gear-stowage compartments, and a 4-foot-wide transom pull-down bench seat opens from the 45-gallon freezer/fish box—with telescoping canopies for sun-drenched days on the hook. According to the builder, the 435cc houses as many as 40 rods. A full rigging station is abaft the console, and a twin 18-foot Taco Marine Grand Slam Outrigger package comes standard. 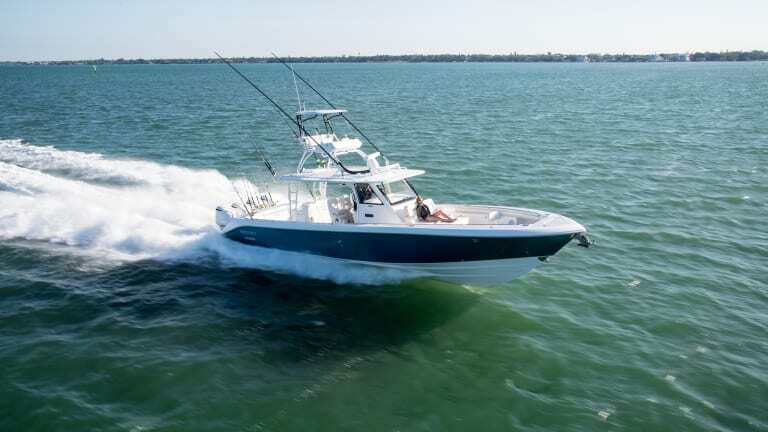 Big-time sportfishermen who want small-time maintenance and upkeep may find a lot to like about the Everglades 435cc. 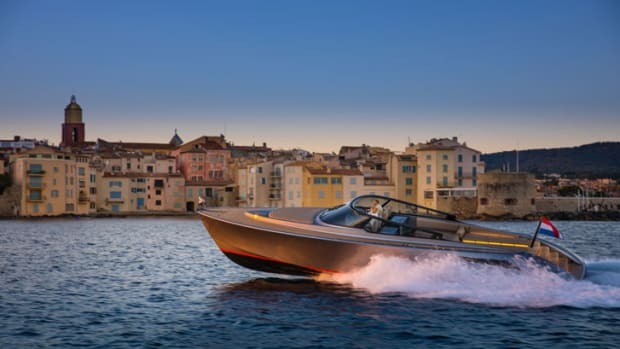 To my taste, she’s also a pleasurable platform for zipping over to the Bahamas on weekends with friends or family, or for use as a versatile superyacht tender.